Many of us know that we desperately need to shift our economy away from growth and inequality to one that delivers wellbeing and justice for people and planet. But how many of us have ever wondered what the 'next economy' actually looks like today? Or how the various economic visions and theories of a new form of economy fit with each other and with current practice? Might it be useful to have one place to go to to see all the organisations around the world who are innovating and experimenting with 'next economy' practice and thinking and to be able to see what they are doing, how, why and with whom? Despite all the great work going on around the world, it's still hard to see how this plethora of work fits together into a broader ecosystem, let alone a coherent progressive force pulling in the same direction. It was those questions that drove a group of people to start an enquiry that evolved into the Real Economy Lab. Two years on, with early support from Esmee Fairbairn Foundation and more latterly the Swiss foundation FPH, the Real Economy Lab (REL) is now building understanding and awareness of the many alternative ways of running and designing a next economy. The Lab aims to be a facilitator and connector of next economy change-agents, to join the dots and create the conditions for convergence across the next economy ecosystem. 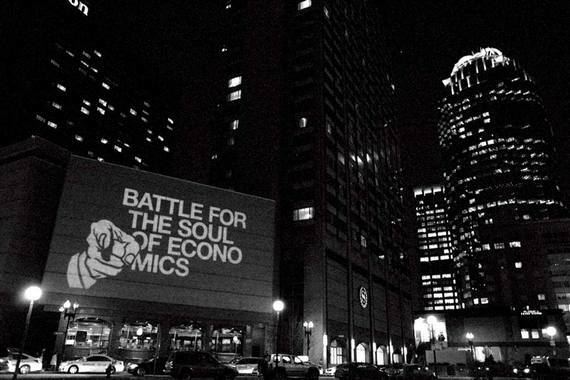 What do we mean by the next economy? The next economy world involves a rich array of theory and of practical innovations and experiments from all around the world as diverse as the Post Growth Alliance, the Next System Project, New Economy Coalition, the P2P, commoner, maker, sharer, buen vivir, collaborative, social solidarity, direct action, localisation and co-operative movements, from transition towns, alternative currencies, the Economy for the Common Good, Positive Money, Common Cause and many many others. Across these various communities people are finding ways to produce, consume, live, learn and interact which can set us on the pathway to a more sustainable, equitable and flourishing world. Much of this is below the radar as yet and partly what we hope to do at REL is to share those stories and encourage others to start or join similar journeys. At the heart of the www.realeconomylab.org is a ground-breaking, evolving, highly visual and interactive network map of the next economy ecosystem. You can view a short introductory video here that shows how our current mapping platform works. The REL is driven by data from surveys which ask next economy organisations about things like: their intended impacts, the sectors of society they aim to work with and influence, the ultimate outcomes and tangible outputs they aim for, their theory of change, the means through which they bring about this change and their positions on key issues like growth, capitalism, ownership, equality, values and on particular political-economic paradigms. We also ask what challenges they face and how we as REL and how others can support their work better. To build our approach and design the surveys and mind-maps, in consultation with leading thinkers and practitioners, we've developed a taxonomy to understand, analyse and make sense of this emerging ecosystem and its common themes, its 'tribes', its archetypes and much more. By analysing and making sense of the responses to our mind-mapping surveys and running social-network-analysis tools, we are able to start to understand sets of common and linking attributes, values and principles across these tribes and organisations. This can then help us understand where new collaborations and cross fertilisation might be valuable. Actors can see who they might benefit from collaborating with, who has similar ways of working or theories of change and so on. In addition to building the interactive online platform, we've presented at and run conferences like the Bristol New Economy Summit and run webinars like this one with our partner organisation the US Next System Project. With nearing 100 organisations around the world having now filled in our surveys, its clear from our work so far that many of the organisations we have surveyed share many common principles and values. As you will see by starting to use our online mind-mapping tool, organisations clearly cluster around sets of common attributes. In previous posts we discuss some early findings from our analysis. 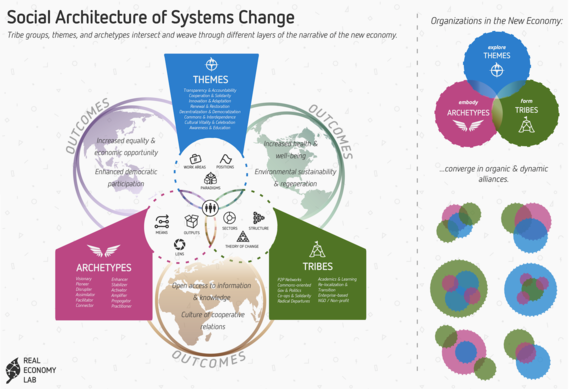 And as well as making sense of and visualising next economy practice around the world we are working on ways to understand how next economy theory links to practice. Working with the Next System Project we are developing a taxonomic approach to seeing how various visions of a future economics map with current practice. Its our hope that doing this will help next economy practice to think more about systemic change and how to bring it about. We hope to make next economy theory more accessible to practitioners and to help those working on theory to see where there are already living examples and iterations of some of the ideas they are putting forward. We have been delighted with the widespread enthusiasm, supportive words and feedback we have had from key players in the 'next economy' world including Professors Gus Speth and Gar Alperovitz of the Next System Project, Rob Hopkins of Transition Towns, Fran Boait of Positive Money, Michel Bauwens of the P2P Foundation and Neal Gorenflo of Shareable. We've also had amazing encouragement from the scores of next economy organisations around the world who have taken the time to fill out our survey, feed back on our work and to become part of what we are building. 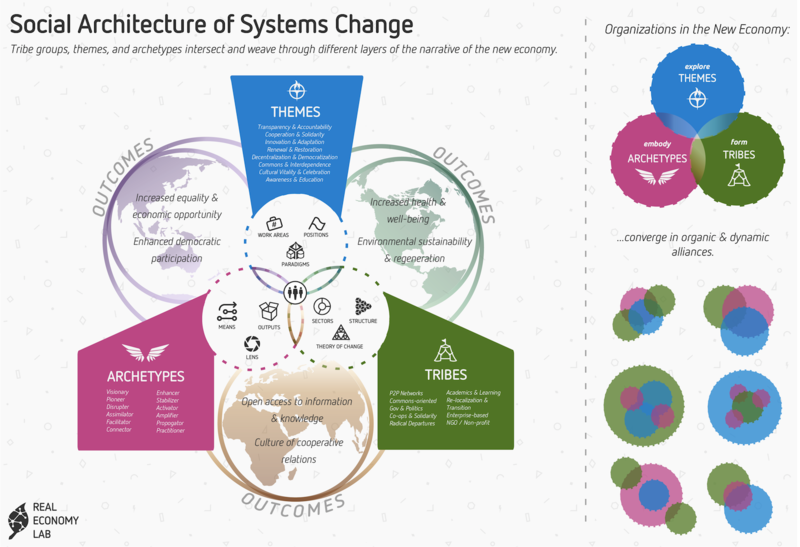 To start to make sense of a very complex set of interrelated organisations and issues, either as a current or prospective next economy practitioner or an interested observer. To illustrate to those not familiar with the next economy space, such as the media and policy makers, just how varied and rich this field of innovation is already. To support potential collaborations between next economy practitioners by seeing which organisations cluster around sets of variables, ways of working etc. To check the mind-mapping before meeting an organisation in order to understand their work. As a tool for next economy project planning and design so that before starting new work on an issue, to be able to explore whom else is working on that certain issue, how and with whom. For ideas on organisations to invite to events on specific subjects or sets of subjects. As input to next economy online teaching, webinars and MOOCs. To help funders engage with this emerging space and understand how it is evolving and which areas perhaps need most support and nurturing. To start to share more new insights which the REL mind-maps are facilitating. Devolvement of simpler introductory walk-throughs and mind-maps which start with stripped down data-sets and then build towards complexity as people get more familiar with the tools. More deep dive mind-maps with more granular data on specific issues like alternative currencies or open coops. The idea of peer review in some form, so that a wise-crowd can be involved in how the mind-maps present issues and organisations. The idea of having other ancillary tools like Metamaps to explain what labels mean and how paradigms, theories and concepts are connected. To use the outreach and emerging community of interest around the Lab to keep people updated and informed of events, new publications and other innovations. To find ways to make it easier for information about organizations to be added to the Lab database and mind-maps, perhaps through a link up via MediaWiki whereby the Lab's database is automatically updated when new data is uploaded onto other sites. We would like to invite others in the next economy practitioning world to join what we are doing. By filling out the survey your information will be included in the database which will power our next round of mind-mapping so that you may begin to see how your initiative connects with, compares to and maps with many other next economy initiatives around the world. We hope this will empower your work to collaborate and cross-fertilise with others in our growing movements.